Story by Sam ‘Ohu Gon III. Photos by Andrew Richard Hara. 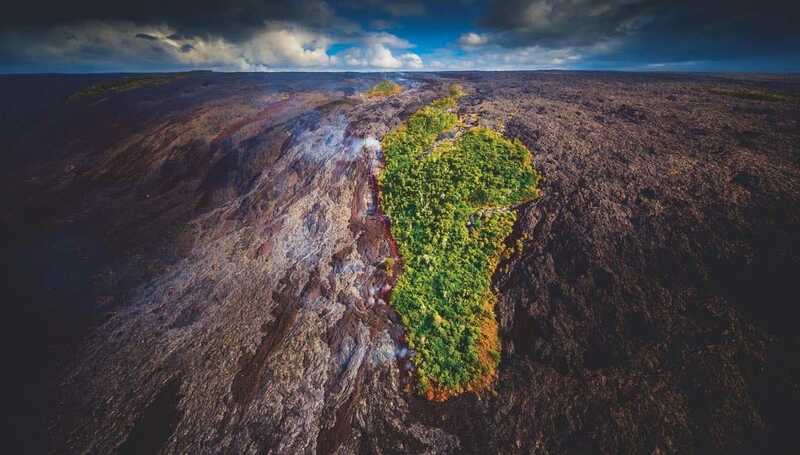 “Kīpuka” is a Hawaiian word that has long been applied to areas of forest spared from destruction during a lava flow, creating an island of vegetation surrounded by glistening fresh lava. But it means much more: The prefix, “kī-,” is an intensifier, and “puka” can mean a hole, or to emerge or appear. 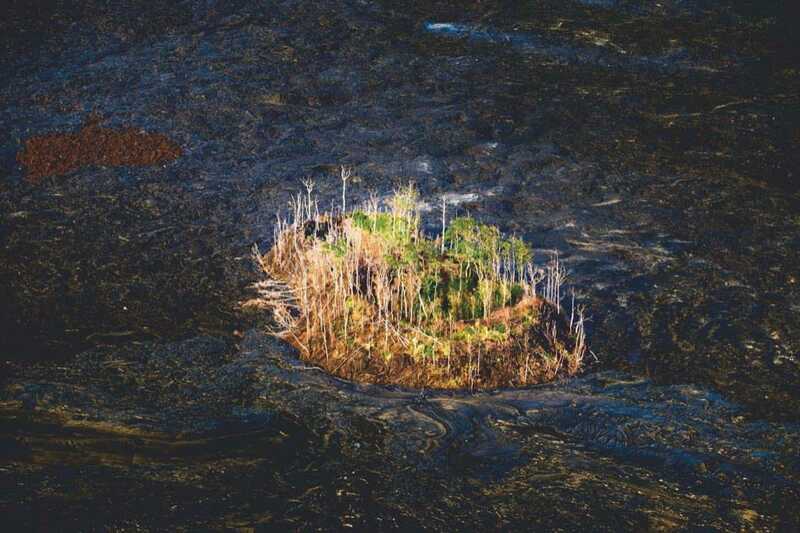 The word implies an intense contrast between what surrounds the hole and what emerges from it: the sky showing through a break in the clouds, a calm spot in a rough sea, an island of forest surrounded by barren lava. All of these are kīpuka. Social scientists even speak of cultural kīpuka—enclaves of traditional Hawaiian practice and language that remain strong despite the modernity around them. 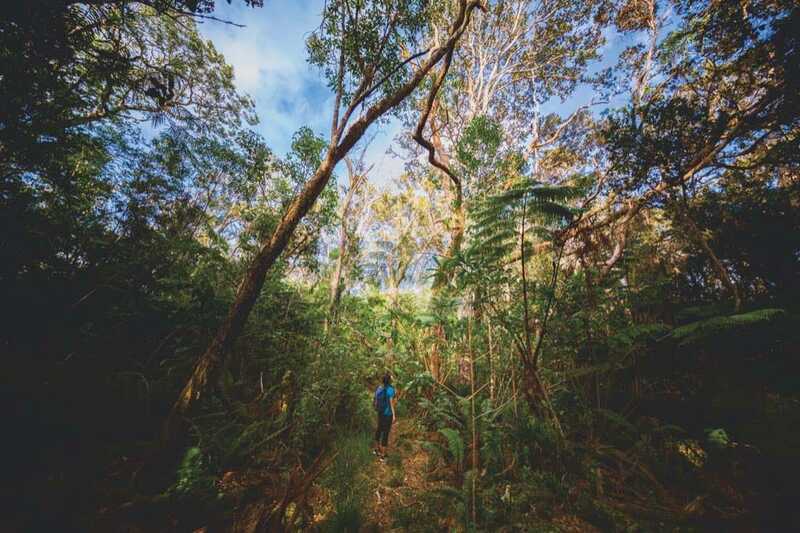 Protected by the lava from the depredations of introduced species like cattle and pigs, Hawai‘i Island’s forest kīpuka are ecological arks where native plants and animals still thrive in the midst of a barren waste. 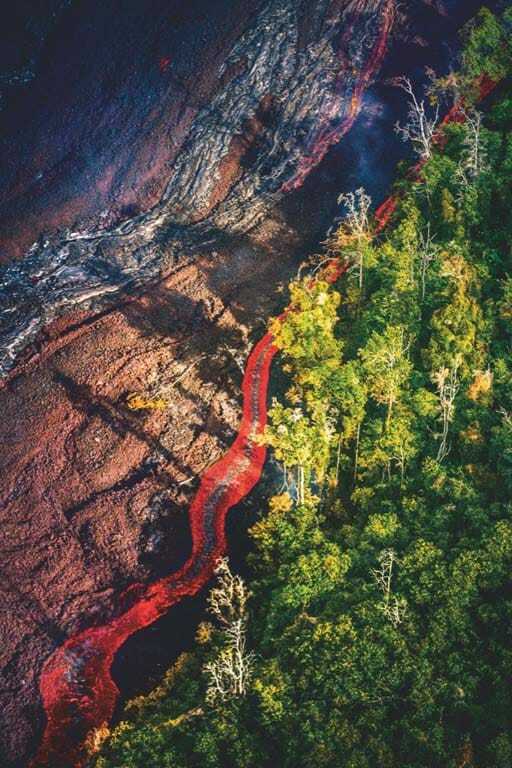 Watching a kīpuka form is a study in near-tragedy, as the fiery swath of a lava flow burns through a forested area, laying waste to all life in its path. More and more of the forest succumbs, and sometimes all is lost—it is as if the forest never existed. But a fortunate section of forest on a hilltop splits the advancing flow to both sides, and the volume of flow is so great that the lava immediately merges again to surround that hill. The trees on the edge burst into flame, but the steam from their dying freezes the lava and forms a barricade. In a freshly formed kīpuka, a ring of dead trees stand as skeletal guardians of their living compatriots within. 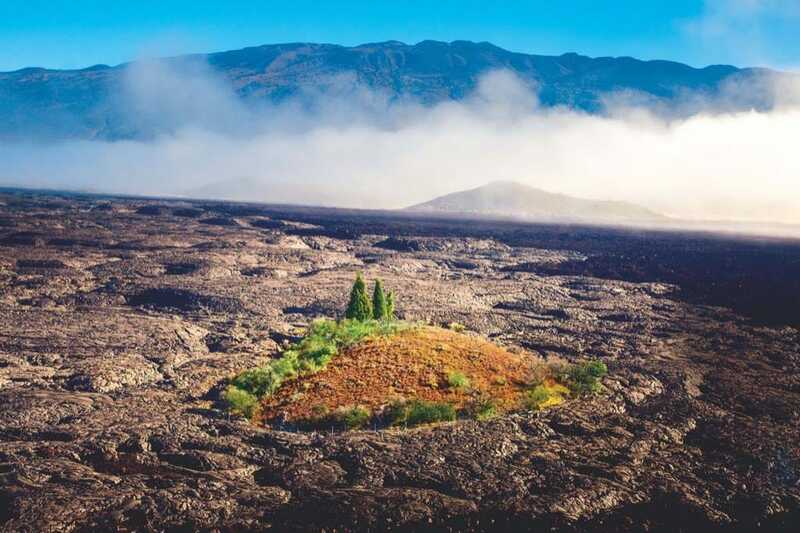 If conditions are right and the lava flow ceases, those dead trees fall and become soil from which the seedlings of surviving plants grow and restore a semblance of the original forest. Another story tells that Pele met two girls, Pāhinahina and Kolomu‘o, roasting ‘ulu (breadfruit) at Manuahi, which was famous for its ‘ulu groves. Taking the form of a frail old woman, Pele asked for food. Kolomu‘o refused, but Pāhinahina shared her breadfruit. That night Hualālai erupted, destroying Manuahi and its groves—except for the home of Pāhinahina. That kīpuka became known as Ka‘ūpūlehu (a contraction of Ka-‘ulu-pūlehu, the roasted breadfruit) to remind us to always be generous to strangers in need. 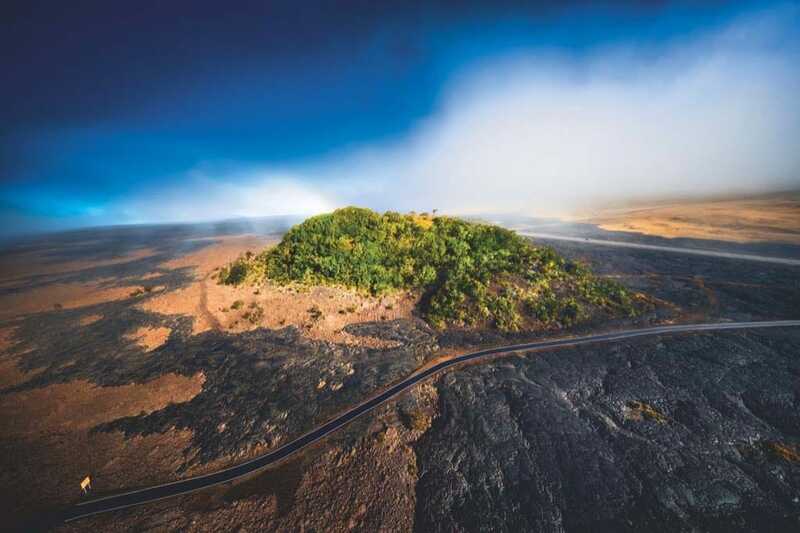 Pictured here: a hilltop in the Kīpuka ‘Ainahou Nēnē Sanctuary, created by an 1843 lava flow. 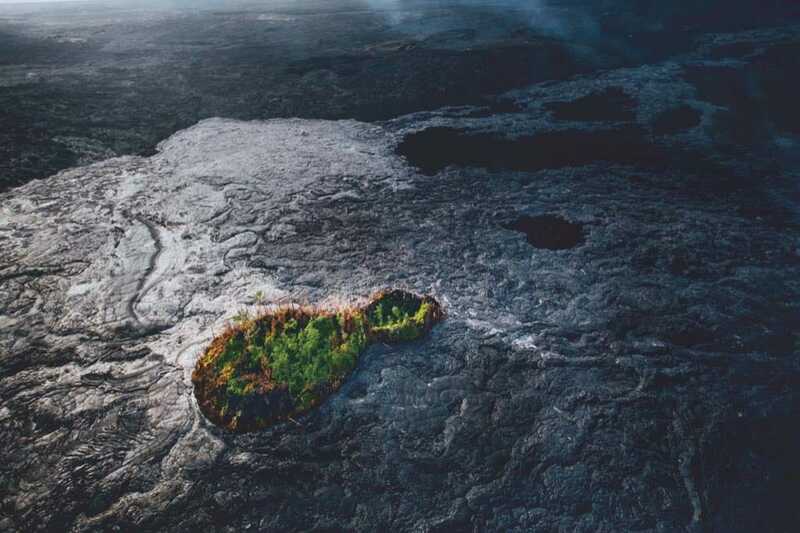 There is something quite startling about crossing the boundary between the sterile, lifeless lava and the verdant interior of a kīpuka like the one in the upper Waiakea Forest Reserve seen on the facing page. It is a doorway to the past, where one can find vestiges of grand forest before Pele consumed the rest. Such kīpuka play an important role in the evolution of species in Hawai‘i. For smaller creatures such as insects, kīpuka act as ecological islands, isolating populations of insects from each other which then diverge into independent lineages. The Hawaiian Drosophila, a genus of flies that includes hundreds of species unique to Hawai‘i, owe some their amazing diversity to having evolved in kīpuka. The various kīpuka along the Saddle Road between our two tallest mountains, Mauna Loa and Mauna Kea, continue to be hotspots for the study of both evolution and ecology. Seen here, a kīpuka to the east of Pu‘u‘ō‘ō. One of the most prominent kīpuka along the Saddle Road is the koa forest on Pu‘uhuluhulu (seen here). Not only is this the tallest canopy forest in the area, but by a lucky accident Pu‘uhuluhulu is at an elevation of 6,758 feet, making it one of the highest-altitude koa stands on the island. Koa prefers older, cinder soil, while the native ‘ōhi‘a tree grows best on younger lava flows. So only ‘ōhi‘a is to be found on the younger lava flows ringing the koa kīpuka on Pu‘uhuluhulu, and that ring is surrounded by yet another ring even younger, unvegetated lava from Mauna Loa. Pu‘uhuluhulu, then, is a unique ecological feature that could occur only in the dynamic lava landscape of one of Earth’s youngest and largest volcanic islands.